AMX has released Rapid Project Maker (RPM) version 1.2. 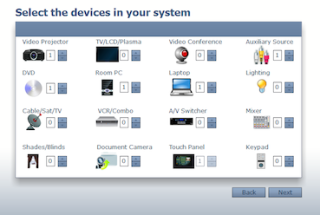 The latest version swells the number of products supported for installations and includes more enhanced project reports. RPM speeds an installer throughout an entire project from start to finish. The step-by-step system configuration guide in RPM was developed leveraging the more than 30 years of programming and user interface expertise of the AMX Professional Services Group. RPM not only simplifies single room deployments but also automatically adjusts to the technology/functionality selected each time a project is configured. A client’s project can even be branded with a dedicated space available for a client logo in the finished UI. Because it is cloud-based, installers can access their projects remotely. Saving and managing a project’s files online at AMX.com reduces on-site service calls and facilitates sharing of resources within an organization. RPM even generates installation and purchasing documentation in addition to complete controller code and touch panel files to make the configuration process more convenient.